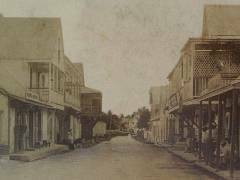 Corozal, the northmost town in Belize, was founded in 1848 by refugees from the Maya Indian uprising against the Spanish in neighboring Yucatan. This uprising, known as the War of the Castes (from the Spanish "castas" or race), began as a war against the Spaniards, but it eventually became a war against the Mestizos. The Mestizos, half Spanish and half Indian, had proved to be formidable allies of the Spaniards, and were thus mortal enemies of the Maya Indians. A massacre at Bacalar, Mexico — a Mestizo stronghold about thirty miles noth of Corozal Town — finally led to the exodus of thousands of Mestizos from Bacalar and the surrounding area. Between 1848 and 1856 more than 10,000 refugees crossed the Rio Hondo, the river that now serves as a boundary between Belize and Mexico. These immigrants sought refuge in northern Belize, and increased the population of Corozal Town to 4500. Mr. James Blake, a magistrate, let them settle on lands in the Corozal District and helped them to establish the new crop — sugar cane. The Mestizo refugees were far from safe in Corozal Town as the Maya Indians from the Mexican base in Santa Cruz Bravo — today Carrillo Puerto — made several incursions in Corozal Town. 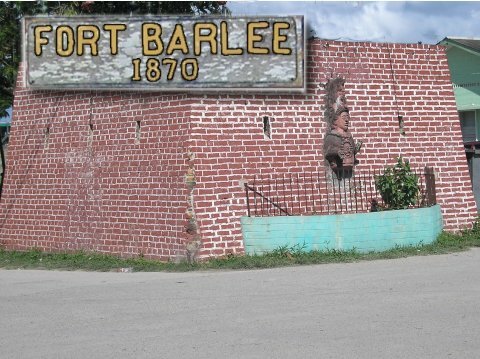 In defense, Corozal became a garrison town and Fort Barlee was built here in 1870. Today, the brick corner supports of the fort surround the post office complex of the buildings across from the central town square. The immigrants brought with them Mestizo culture: Spanish and Yucatec Maya language, Catholicism and Maya folklore, the use of alcalde, their family structure and way of life. Soon, there emerged a local replication of the society of the Yucatan within the boundaries of a country ruled by English expatriates. Across the bay from Corozal Town are the mounds of Cerros, the first Maya coastal trading center. Cerros is considered one of the most important late preclassic Maya sites because it represented the first experiment with kingship in the Maya world. The remains include a number of temples, plazas, ballcourts, canals, and minor structures. The most interesting artifacts so far discovered are the five jade head pendants. Within Corozal istself can be found another Maya ruin from the fourteenth centry AD. Known as Santa Rita, the pyramid site sits atop the remains of a Maya city that dominated the area for more than 2000 years. Burial sites rich in jewelry and artifacts have recently been unearthed here. Santa Rita was probably part of ancient Chactumal, the Maya capital of the area at the time of the first Spanish attempt to conquer the Yucatec Mayas in the early 16th century. 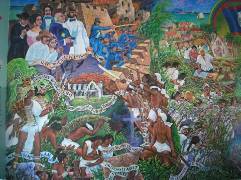 A sight worth seeing is the vibrant mural in the Town Hall. 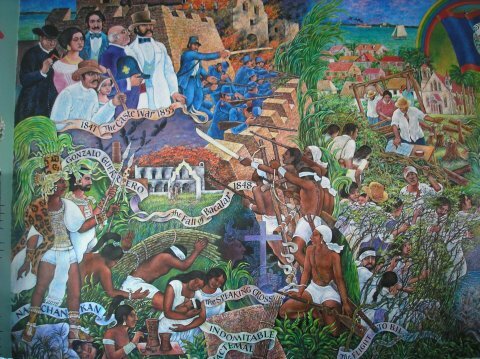 Painted by the Belizean-Mexican artist Manual Villamore, it surrealistically depicts the rich history of Corozal. Pictured to the right is just a portion of the mural. 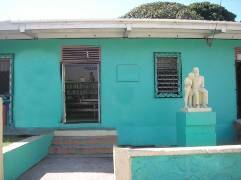 Next door to the Town Hall, the Corozal Library houses an unusual collection of books on Belize from past to present. 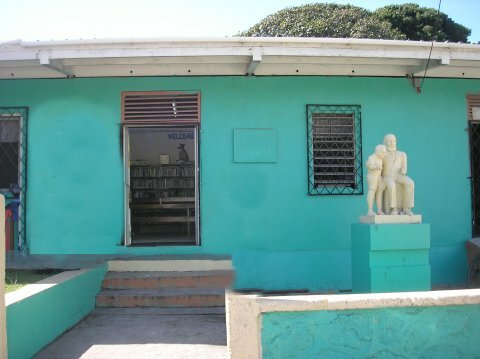 The Library’s cultural, educational and recreational activities are supported by the Friends of Corozal Library. For a small donation, you can obtain a map of Corozal that provides a Self-Guided Nature Walk around town, describing trees and birds. This section on the History of Corozal is taken directly from the map, with permission of the Friends of the Corozal Library. This Photo History has many old photos, mostly from the early part of the Twentieth Century. 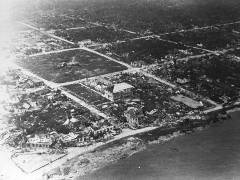 Hurricane Janet destroyed most of Corozal Town on 27th September, 1955. This topic includes old photos of the damage and interviews with survivors. Printed from https://corozal.com — Early History.